Lymph nodes are small kidney bean shaped organs. They are between .1 cm and 2.5 cm long. They filter the lymph before it is returned to the vascular system. There are three areas where lymph nodes aggregate: inguinal nodes, the axillary nodes, and the cervical nodes. The central nervous system does not contain lymph nodes. 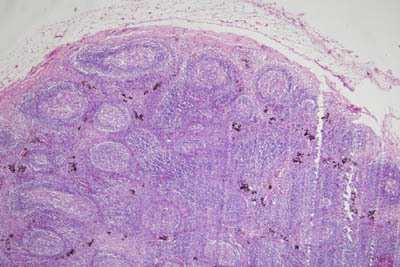 On a histology slide, it is apparent that a lymph node is surrounded by a capsule. The capsule of the lymph node is dense connective tissue. The capsule sends trabeculae into the node. A lymph node is divided into a cortex and medulla. Deep cortex, tertiary cortex, juxtamedullary cortex and paracortical zone are all different words for the same area of a lymph node. The deep cortex is the inner region of the cortex. The deep cortex is that portion of the node next to the medulla. Histology of a lymph node. Histology slide courtesy of Histology-World! The discrete areas of lymphatic tissue seen on a histology slide of a lymph node are called lymph nodules. A secondary lymphatic nodule is characterized by the presence of a germinal center. Lymphatic nodules are not found in the deep cortex. Lymphatic nodules are found in the outer cortex. The immune cells are embedded in a reticular tissue framework. Afferent lymphatic vessels carry lymph forward into the lymph node. 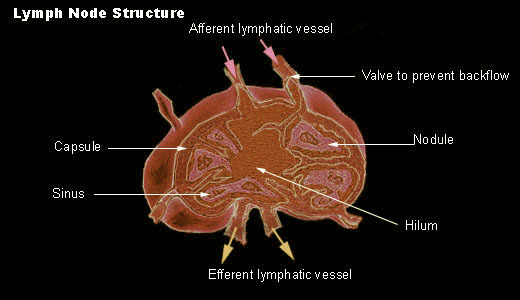 The efferent lymphatic vessels carry lymph away from the nodes. University, Atlanta SEER Cancer Registry, Atlanta, Georgia, U.S.A.